Letâ€™s all be honest with ourselves, this yearâ€™s state meet was much more relaxing than last yearâ€™s. Â Not only did having the divisions separated create a more cohesive ambiance, but we also left the building at about 3:30pm this year. Â A big thanks to 802Timing for always keeping meets running smoothly (and another shoutout to TrackLife Timing for managing all the other meets this season). First off, congratulations to the winning teams! 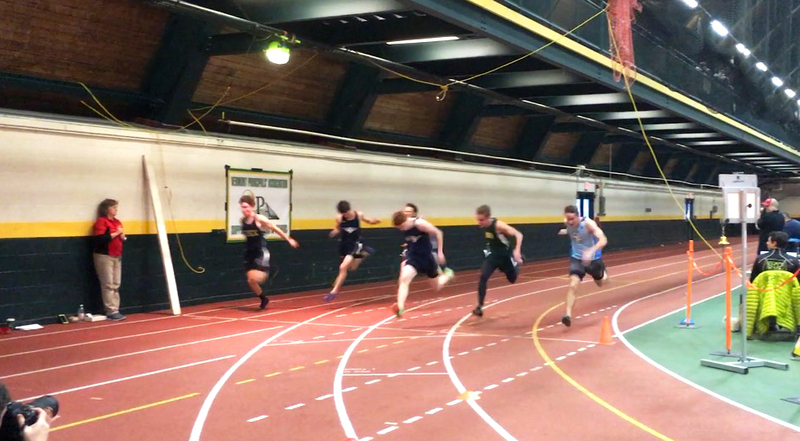 Saint Johnsburyâ€™s boys and girls both won the girls team handily fended off any competition, while the boys team barely held off a charging MMU and Essex in a competition that ended with all three teams within 2.5 points of each other. Â A single point swing in any direction could have changed the entire outcome of the meet. Â In the Division 2 competition, Rice Memorialâ€™s girls team came away with another win (how many in a row is that? ), while Milton won the boys side with a 13 point win over Rice Memorial. Let’s not breeze over how close the Division 1 boys competition was though; With every event scored except the 4x400m, the score was Saint Johnsbury-100.5, Essex-97, MMU-94.Â With Saint Johnsbury going into the meet as the top seed in the 4x400m, it was their race to lose.Â MMU ran in the heat before Essex and Saint Johnsbury, and laid down the soon to be winning time of 3:42.91.Â That put MMU into the lead with 104 points.Â That left Essex and Saint Johnsbury to battle for the win.Â For Essex to win, they would need to swing four points over Saint Johnsbury (or have Saint Johnsbury get disqualified for running inside the line), meaning they’d need to beat them by two places.Â The race went off, and in a close finish, Essex beat Saint Johnsbury with a time of 3:45.79, to Saint Johnsbury’s 3:45.93; enough for second and third place, respectively.Â Not quite enough for the point swing, and the rest is history. South Burlingtonâ€™s girls ran home second, third, and fourth in the 55m (Kakalec, Oâ€™Brien, Lowensohn). Saint Johnsbury girls went 1, 2, 3, 4 in the 55mh (Cowan, Wescott, J. Rotti, Leach). North Country’s Aleksei Bingham won both the 1500m and the 3000m. Oxbowâ€™s Izzy Giesing set a Division 2 state record in the 600m.